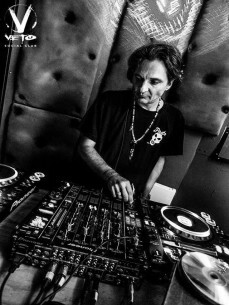 Simone Laino DJ and promotor start 1990 Dj name KOKA in private House Party in Milano Italy and in 1992 the DJ name is SIKO in Ibiza party in the mountains under the name Tribe with Ibiza Dance Tribe Reunion. His consecration in the history of the most sensational island groups came with the "Tribe in Aqualandia" party. Parties organized within the Talamanca water park. From 10 am until mid night, several hours of non-stop electronic music movement and entertainment. Since 1994 Tribe started to create events in clubs such as Pacha, Ku and especially Amnesia. Among them, some of their greatest hits, remembered even today by many, were the Amnesia. We did with amnesia ibiza 2 cd's production Ibizarre rec. turin studios with Stefano Barrio. Trance Live Concerts organized in collaboration with famous British labels such as Blue Moon release and Tip Records and special Friday together DJ Marc Spoon and Robert Miles, Positiva Rec. In the winter of that same year, the group began to organize the Tribe Ibiza Reunion events at the Escape Theater in Amsterdam, one of the top clubs in the city. The success was great. They answered the call hundreds of people who came not only from Ibiza but from all over the world creating a real Tribe Reunion. In September of 2015 the group came back to the island with the first of several events at Elements of Playa de Benirras followed by others at Km.5 and Boutique Hostal Salinas all the way through the end of October. The season 2016, started on May 22nd and that will also last until the end of October. Tribe Reunion have planned many more events, in different place. One of the prerogatives of the group is to move just like a nomadic tribe bringing his music and performances in various locations on the island. These include the monthly appointment with Elements in Playa de Benirras, the Cultures Tribe fridays at Boutique Hostal Salinas, the Speakeasy Roof Parties at Le Pigeon Voyageur Art Gallery with an amazing views of Dalt Vila, Guarana in Santa Eularia, Veto Club in Ibiza and the bright new Lamuella of San Lorenzo just to name a few. Also from Wednesday June 21 the group will broadcast, live streaming, with the group new radio show "Ibiza Dance Tribe Reunion On Air" on Smile & Surprise Radio 89.4 Fm. We have been an inspirecion as a way of life for many young promoters and fundamental passion in the youth music movement, always open to new ideas and collaborations with other promotions and events groups, we remain focused on the goal of bringing people together in the name of music, art and Tribe Culture.